With Labor Day coming up here in the US, kids are headed back to school. Which means they’ll soon be clamoring for lunch box treats and after-school snacks. You could make that perennial favorite, chocolate chip cookies. But why not go one better and make these awesome chocolate chip bars? Kids will love them. And grownups may sneak some into their lunch bags too. Mrs. Kitchen Riffs is the baker in our household, and she adapted this recipe from one she found on the King Arthur Flour site. Prep time for this recipe is about 20 minutes. Baking time adds another 25 to 30 minutes. These bars are easier to cut if you let them cool completely, so allow another hour for that. BTW, you really don’t want to overbake these—see the first Note. This recipe yields about 2 dozen Chocolate Chip Bars. Leftover bars keep well for a few days if they’re sealed in plastic wrap and stored at room temperature. Or you can freeze them for a month or so. Preheat the oven to 350°F. Butter a 9"x13" baking dish and line it with parchment paper. Whisk together the flour, baking powder, espresso (if using), and salt. Set aside. Cream the butter and brown sugar in the bowl of a stand mixer (or in a large mixing bowl, if using a hand mixer). Add the vanilla extract, mixing until well combined. Add the eggs and beat well to combine. Add the chocolate chips, chopped chocolate (if using), and chopped nuts. Mix well to combine. Add the dry ingredients and beat until well mixed. Scrape the batter into the prepared baking dish, spreading it to the edges with a spatula or knife. Smooth the top. Bake the bars for 25 to 30 minutes, or until the edges look firm. Don’t over bake (see Notes). Remove the baking dish from the oven, and allow it to cool on a rack. Cut into 2 x 2 inch bars and serve. It’s easy to over bake these bars, so take care. Don’t try to judge them by inserting a knife or tester. Even though they may appear soft and “molten” in the center, they’re done when their top has turned golden brown and the edges are firming up. They will set as they cool. Why grease the baking dish and use parchment paper? 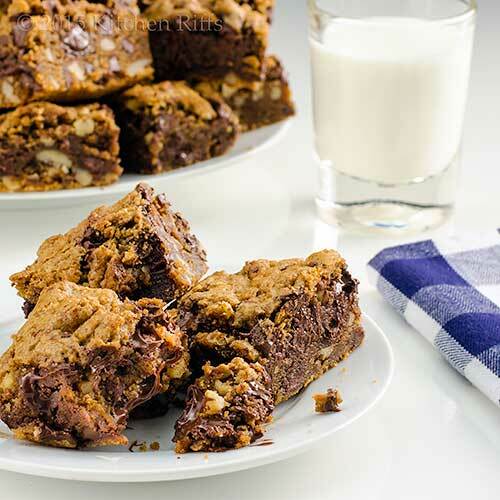 Because these bars can stick like glue to your baking dish (especially when the chocolate chips melt). Using both butter and parchment paper provides extra protection against that. 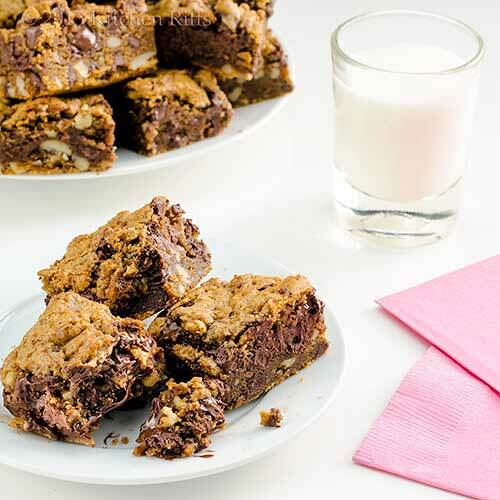 You can leave out the espresso if you want to make these bars super family-friendly. But we strongly suggest using it. Espresso deepens the taste of chocolate, and even the most sensitive palates probably won’t be put off by the small amount used in this recipe. What brand of chocolate to use in these bars? Basically, whatever you like. For chocolate chips, we’re partial to the classic Nestle brand, although Ghirardelli makes a mean chip too. For bar chocolate, we favor Ghirardelli these days, but we’re always experimenting. Either light or dark brown sugar works well in this recipe, although dark brown has a somewhat deeper flavor. Kosher salt is coarser than regular table salt, so it’s less salty by volume. If using regular table salt in this recipe, reduce the amount to ½ teaspoon. We recommend using high-quality (pure) vanilla extract in this recipe. Its flavor is so much better than the imitation kind. Pure vanilla extract is made by soaking vanilla beans in a mixture of water and alcohol for several months. If the label doesn’t say “pure,” that means it’s made from synthetic vanilla. The artificial kind is usually derived from the sapwood of several species of conifers—or from coal extracts! How appetizing. Not. BTW, the FDA requires that pure vanilla extract contain at least 35% alcohol. The flavor of some imitation vanillas can be nasty. You don’t have to spend a fortune on pure vanilla extract, but getting decent quality does mean spending a bit more for something that’s not loaded with sugar or imitation flavoring. Do yourself (and your family) a favor and get the real stuff. Eggs carry a slight (but real) risk of salmonella. Once you thoroughly cook eggs (as you will when you bake these bars), they’re fine. But if you’re going to taste the dough before baking it—and who can resist?—we suggest using pasteurized eggs. If you have leftover nuts, we recommend storing them in the freezer. They can go rancid at room temperature, particularly during warm weather. We like to eat these bars neat. But if you want to serve them as dessert, you could plate them with some ice cream or whipped cream. “These might be even better than Chocolate Mascarpone Brownies,” said Mrs K R.
“Well, with cooler weather coming, I’ll soon be baking again,” said Mrs K R.
I'd consider going back to school if these were in my lunch box every day. The espresso is a bonus. These look so good. Hat's off to the Mrs. So now you made me go to the freezer and steal a chocolate chip cookie. These look so good. I always had homemade cookies waiting for my kids when they came home on the first day. It is a good tradition and one that should still be kept! I love to bake cookies! My kids have been back for close to 2 weeks already! You guys have it easy starting after Labour day. Yes, my children would love these, but I'm afraid there won't be any left for the lunch box, I'm pretty sure they'll be gone with after school snacking! Hi Surprised Gourmet, the expresso is really good in these. And I'd consider going to school if I had these, too. ;-) Thanks for the comment. Hi Abbe, cookies are wonderful aren't they? Heck, anything with chocolate chips is wonderful! Thanks for the comment. Hi Nazneen, actually most kids around here have been back in school for a week or two, also, although some start around Labor Day. It gets confusing! What's not confusing is how good these bars are. ;-) Thanks for the comment. OMG! You had me at chocolate! I love these they look so yummy and soft. I have chips on hand so I think this will make a good treat for the weekend. They are simple and love your the added coffee. You are right it really does enhance the chocolate flavor. 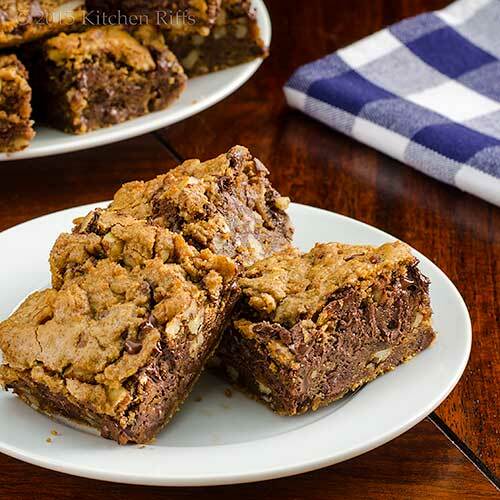 These bars would never last long in my family....Thanks for sharing this recipe and for all of your notes...Kudos to Mrs. K R..Have a great rest of the week..
Hi Dottie, hard to resist chocolate, isn't it? These really are good -- hope you have a chance to make them. ;-) Thanks for the comment. Yum, if I were a teacher and saw one of my students with these in their lunch, I might be tempted to.... Never mind, I would not do that,... well maybe I would. They look so good! I was totally just thinking that I hoped you had posted a dessert. This one does not disappoint. Perfect for all kinds of end of summer and beginning of fall activities. Hi Chris, sure you would! Who wouldn't? :D Thanks for the comment. Hi Laura, it's been way too long since we've done a dessert. But this more than makes up for that -- it's really, really good. :-) Thanks for the comment. We'll be going on vacation soon and I know of three BIG kids who would love these for afternoon snacks! Sorry, let's make it 4 kids! :) Mrs. KR outdid herself with these. YUM! Hi MJ, you need these so you don't get cranky while traveling. :-) Thanks for the comment. Yes, please. All of these for me, please!! I love them. The world-wide-web is saturated with choc chip cookies. These bars are a fabulous refreshing change form the usual. Thank you John! OH YES! I don't even like chocolate but YOU make it look REALLY REALLY GOOD! I wish I was a kid to carry these in my lunch box... haha! I would be all anxious and excited to have them at lunch time. John, these bars look so chocolaty, and nutty, and most definitely scrumptious! Me thinks a batch for the family is on the task list. Thanks for sharing the recipe. Remember those 'Roy Rogers' lunchboxes from the 50s or 60s? If I had your bars in my lunchbox then, the other kids would surely have grabbed my lunchbox and gobbled them all up! Hi Amy, we'll need to make another batch so you can have them all. This one is gone. :-) Thanks for the comment. Hi Nagi, we like chocolate chip cookies, but these are better. ;-) Thanks for the comment. Hi GiGi, it IS good, REALLY REALLY GOOD! ;-) Thanks for the comment. Hi Denise, just make a bat ch and you'll feel like a kid again. Maybe we should have called these "Fountain of Youth" bars. ;-) Thanks for the comment. Hi Brooks, your family will thank you. With tears in their eyes. ;-) Thanks for the comment. Hi Fran, I do remember those Roy Rogers lunchboxes! Had forgotten about them, but definitely recall them. Very cool! Thanks for the comment (and the memory!). My family loves chocolate chip cookie bars and I have a feeling yours would disappear in a flash around here! Terrific recipe! Oh, so she does cook - it's not just all cocktails on the deck:-) These look fab Mrs K R - will be giving these a try when I'm in my new kitchen! Hi Liz, these really do disappear in a hurry. So, so good. ;-) Thanks for the comment. Hi Rachel, LOL! It's been awhile since we've featured Mrs KR's baking -- have to remedy that. ;-) Thanks for the comment. Hi,!! your chocolate chip bars caught my eye ! My son would love these! Hi Nammi, I'll bet your son would be soooo grateful if you made these for him. :D Thanks for the comment. Hi Lizzy, this really is a great treat! And your warmer weather is definitely on its way, so be on the lookout. ;-) Thanks for the comment. I am not sure this would make it to my teen's lunch bag. I may not want to share. Scratch that. Those I WILL NOT share! These look like something I might hide in a brown bag and take to the park with book to read and eat. My kids would flip-over for these bars. What a wonderful baker wife you got! These looks so tempting and I need to try this recipe soon for my family. Thanks. Hi Ansh, taking these to the park and eating them while reading a book sounds like a wonderful idea! Teens should learn how to bake anyway, and make their own. ;-) Thanks for the comment. Hi Holly, these really are super -- I flip over them! Thanks for the comment. Hi Julie, bet your kids wouldn't trade these. Well, maybe they would if they could give one of these for all the loot in the world. ;-) Thanks for the comment. Fantastic looking bars. I love bar making, it's so much less time consuming than cookies. I've never added espresso to my cookies/bar recipes, but I'll bet it compliments the chocolate beautifully! Mrs KR is a fantastic baker - these bars are definitely an A+! Though, I'd be tempted NOT to share these! Love the espresso in them! Hi Kristi, you should try the espresso -- really add a nice, subtle note of flavor. Thanks for the comment. Hi Shashi, Mrs KR really is a good baker. Good too! But I'm not complaining. :-) Thanks for the comment. Who could resist one of those bars? Not me! Hi John, I love sweet things that come in a bar shape, especially when chocolate is involved. Looks like a keeper of a receipe! Hi Pam, these are always gone pretty quickly whenever Mrs K R makes them. Actually, we tend to give a lot away, otherwise we'd definitely be eating them! Thanks for the comment. Hi Pamela, sorry about that. ;-) That's one of the dangers of blogging, isn't it? Always so much tempting stuff out there! Thanks for the comment. Hi Cheri, I like bars too, although when it comes to chocolate I don't much care about the shape. :D Thanks for the comment. They look great John, SO much chocolate which means so much perfect! Oh yum these sound terrific! I love chocolate chip cookies and turn them into bars with that addition of espresso powder makes them that much more appealing. My family will love these. Hi Barb, definitely mean kids of all ages! I never stopped being a kid. :-) Thanks for the comment. Hi VIcki, just a little espresso powder really can add a ton of flavor. It's good stuff! Thanks for the comment. Hi Carolyn, they're all gone, thank goodness, otherwise I'd be inhaling them, too. ;-) Thanks for the comment. Simply damn delicious choco chip bars!!! Hi Bobbi, I work at being a good QA tester. :-) Your boys will love these. And I'll bet a batch is just about the right size for them! Thanks for the comment. Hi Rocquie, this is a good one. We need to make it again soon! Thanks for the comment. Hi Dedy, they are indeed! Thanks for the comment. LOL, I always enjoy your conversations with Mrs. Riffs. These look so delicious and now I am craving chocolate. Good tip about the nuts - I didn't know that but will get right on it. I once bought cheap vanilla extract and learned my lesson! Hi Robyn, I'm always craving chocolate! Need to urge Mrs K R to make this again. :-) Thanks for the comment. Hi Amira, bet your kids will love this! You, too. ;-) Thanks for the comment. Are you sure there is dough in this recipe, cause it mostly looks like chocolate. Totally fine by me :-) Great bars and love the espresso added in there too. Hi Evelyne, we like a high ratio of chocolate in our dough. :-) Thanks for the comment. HI Charlie, these are definitely too good to trade! Although, of course, I suppose it depends on how much loot one can get in return. ;-) Thanks for the comment. I would have loved to have one of these in my lunchbox as a kid!! YUM! Hi Kristi, you can make a batch and pretend you're a kid. :-) Thanks for the comment. You two are so cute! Love these bars and yes I would go back to school if someone put these in my lunchbox. Can't wait to see how you both do on your next homework assignment. Bravo! Hi Tricia, just photographed the next homework assignment. :-) Wish we had some of these bars left to celebrate! Thanks for the comment. With espresso, I know I would love these bars. Decadent and tempting!! Hi Julie, these really are decadent. Which, of course, always tempts us. :-) Thanks for the comment. Hi Marcelle, yeah, we're real chocolate fiends too. :-) Thanks for the comment. Hi Unknown, the espresso really adds a nice little zing to these! Thanks for the comment. Hi Debra, so, how long until winter break? :-) Thanks for the comment. Hi Beth, I like it when Mrs KR gets in the kitchen too! :-) Thanks for the comment. Hi Nancy, it's way too easy to eat a batch of these in one sitting! Don't ask me how I know this. :-) Thanks for the comment. I can't believe that Aug is ending soon. The kids are going back to school and your summer is going to be over soon... but it is still so so cold in Melbourne like our winter seems to be never ending!!! 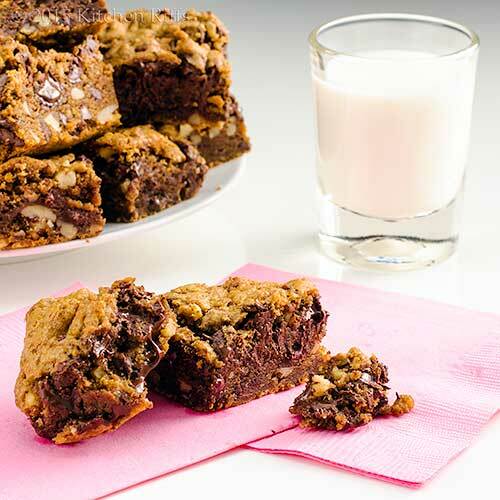 Whether it is winter or summer, school or no school, I'm sure everyone will love your chocolate chips bars! Yum! Hi Zoe, we've been loving our summer,but cool weather is just frond the corner! Enjoy the warm weather which you'll soon be seeing. And bake these bars no matter what the weather. :-) Thanks for your comment. Yummy goodness in every slice. Hi Pat, I need one of these for breakfast right now! :-) Thanks for the comment. Hi Lux, true yum! ;-) Thanks for the comment. It's bittersweet to say bye to summer vacay. I love these chocolate chip bars, so perfect for school snack for teachers, I would love to have some right about now. Your conversations are too cute. Hi Asha, I agree seeing summer go is always kind of sad. But the change of seasons is always fun, too. :-) Thanks for the comment. Hi Lea Ann, 20? Sure. 5 minutes? That's impressive! :-) Thanks for the comment. That is perfect with a cold glass of milk, Yum! These sound so good, I would definitely make a batch and take to work with me! Hi Raymund, yup, milk and baked chocolate goodies go so well together, don't they? Thanks for the comment. Hi Caroline, work will go much better! And your coworkers will love you. ;-) Thanks for the comment. These bars are over the edge with deliciousness for sure! My family would love them, even though the kids have long been out of school, I definitely have to make them for our little grandson! Love your version of homework! Happy Baking Mrs KR! Hi Pam, if only I had that sort of homework when I was in school. :-) Thanks for the comment. Hi Dana, aren't they great looking? And taste much, much better than they look. :-) Thanks for the comment. Good golly, forget the kids! These make me realize just how long it has been since I have made and eaten good old brownies! These looks sensational! Hi Jamie, these are really good -- I predict you'll like them. :-) Thanks for the comment. I would love to have a piece of that chewy bar. My kids would definitely love this. Will try it soon. Thanks for sharing! Hi Shibi, kids of ALL ages like this. :-) Thanks for the comment. Hi Carol, we did indeed hit the jackpot! Thanks for the comment.